Among the several stories that are interwoven, perhaps the most recurrent and controversial theme that is touched upon is child abuse. There is, for instance, Frank Mackey, played vigorously by Tom Cruise, who as a child was abandoned by his father to attend his dying mother all alone. 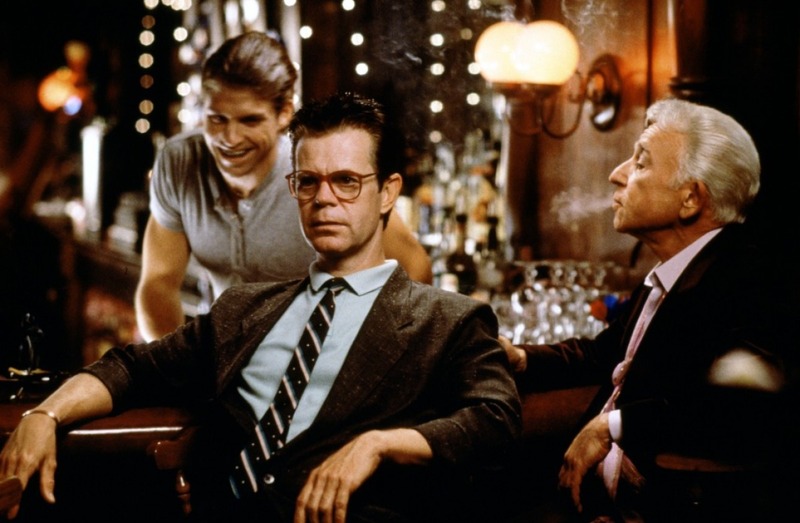 There is also Donnie Smith, wonderfully played by William H. Macy, who is a troubled man that was traumatized by a short spell of fame as a wonder-kid in a Jeopardy-like talent show that his parents forced him to remain at. Similarly, there is a present day wonder kid at the same talent show who is clearly being used by his dad and show producers alike in order to make money. Lastly, there is the disturbing story of the drug addict who was molested by the show’s producer when she was younger and now cant cope with the trauma. Among these tales, there are others of equal resonance like that of a cop, played by a surprising John C. Reilly, who is an honest and decent officer that is perhaps too conservative and uptight for the kind of job he has. Like our other characters, he learns a great deal along the way, changing for the better after going through deep personal realizations that were produced by unexpected events. Magnolia also relies on opposites to make its point across. While the character played by Julianne Moore regrets all of the things she has done to her much older, now dying husband; his nurse played by the always on-key Philip Seymour Hoffman, spends the whole film trying to help a stranger that despite having confessed atrocious acts, deserves, in his view, a chance at redemption. Interestingly, all of our characters come to a sort of epiphany that quite decisively changes their destiny. Not all of them deserve redemption though, and the film goes a great distance to show us that there is a certain invisible string that connects all of us which determines our future without our awareness. For those who meet their tragic end, life has been but an accumulation of lies and regrets that they ultimately cant overcome. Their destiny could have been different if others had not changed them along the way in significant, yet quiet ways. The film opens and closes with a narrated tale about coincidences. In the opinion of this film, there are no coincidences, only a strange string that significantly ties all of us together, determining our path, giving us opportunities or obstacles as it sees fit. This connection is arguably a spiritual one that is more or less imperceptible to the vast majority of us. Famously, Magnolia resorts to a biblical reference to not only tie the characters together at the peak of the film, but to give the story a spiritual gravitas that suggests that the heart of the movie lies in faith, one that is not necessarily based in the God that is presented to us from religion, but one that acts mysteriously and almost always imperceptibly. 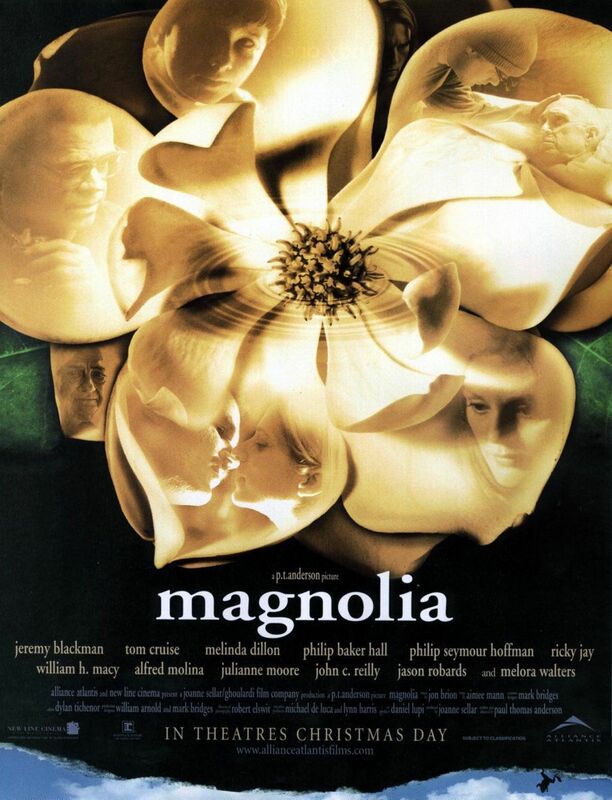 Magnolia is a remarkable achievement for director Paul Thomas Anderson who in 1999 had only released two major feature films. He, of course, would go on to direct the well-received “Punch-Drunk Love” and the masterful “There Will be Blood” in the next 10 years. Magnolia does have a few hiccups here and there. Most of which are derived from over dramatization, with some performances being more effective than others. Standouts include the usual underrated actors like P.S. Hoffman and William H. Macy, but I must say I was especially surprised by the moving performance of Tom Cruise who is at the top of his game as Frank Mackey. Also worth noting is that such an incredible and emotional story is all limited to a mere 90 minutes of running time that feels like a lot less by the time we are done with it. What can I say? time flies when watching great films. Haven’t seen this one in years. Should watch it again since I only saw it midst my teenage tumulus, would be interesting to compare not that I’m more grown up, what different undertones I’d find. So many films to see and to rewatch! I think the film lends itself to several viewings because I’m sure you’ll take something different out every time, especially if you have not seen the movie in years. A great film that gets a little too religious by the end, but the performances and Anderson’s steady-hand of direction is what really held me over with this flick. Great review. An argument can be made like you suggest that the film overplays his hand when it comes to religion. To me the whole “frog sequence” was a device more than a statement. One that not only allows us to remember a very specific and very unique part of the film that stays with us, but it provided PT Anderson with the opportunity to unite the stories of the characters while determining their fates at that precise moment. My only criticism of the film is the over dramatization of some of the performances which made the movie a bit too much, at times exaggerated in its approach. Besides that, I can’t find much else that is worth criticizing. Good review of one of my favourite films. The Aimee Mann soundtrack is great, which is sort of emotional like the story and holds it together. I like how the character’s are fragile, while they also are trying to be strong.I love films that are about feelings. For me, PT Anderson’s best film. I agree about Tom Cruise, maybe he should have got the supporting actor oscar that year? Could be his best ever performance. I don’t know if I consider it to be PT Anderson’s best, although I would definitely on the same level as There Will Be Blood, which was one of my favorite films of 2007. As far as Tom Cruise goes, I don’t think I have seen a better performance from him in any film. I believe the character was right for him and his performance, although theatrical in some aspects, has a lot of depth. You can see the troubled mind of Tom through his eyes, and you feel as if you’re really getting to know this Frank Mackey. I would have to go through my archives to be able to tell you Tom Cruise deserved to win the Oscar. One thing is for sure, he was deserving of at least that nomination. 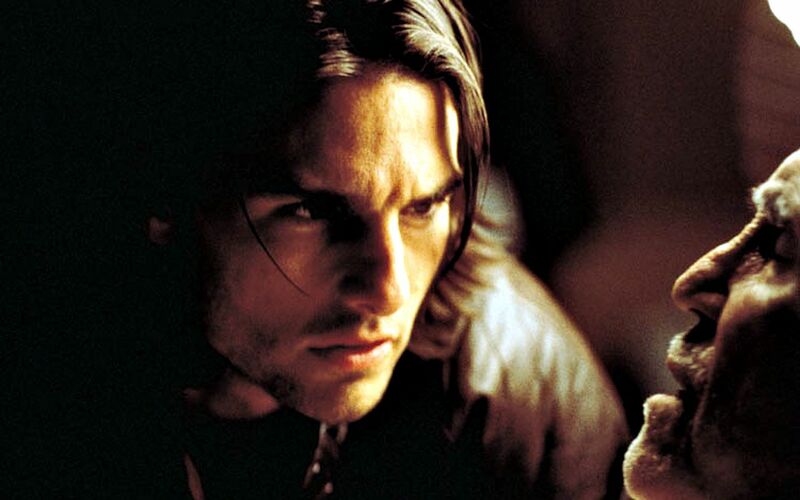 Whenever I think of Magnolia I can’t help but think of Tom Cruise’s against type performance. Although I prefer Boogie Nights, this is an excellent film.